A Burmese supporter of Aung San Suu Kyi cheers after stopping a car from going into her speech in the fish market in Mahachai. 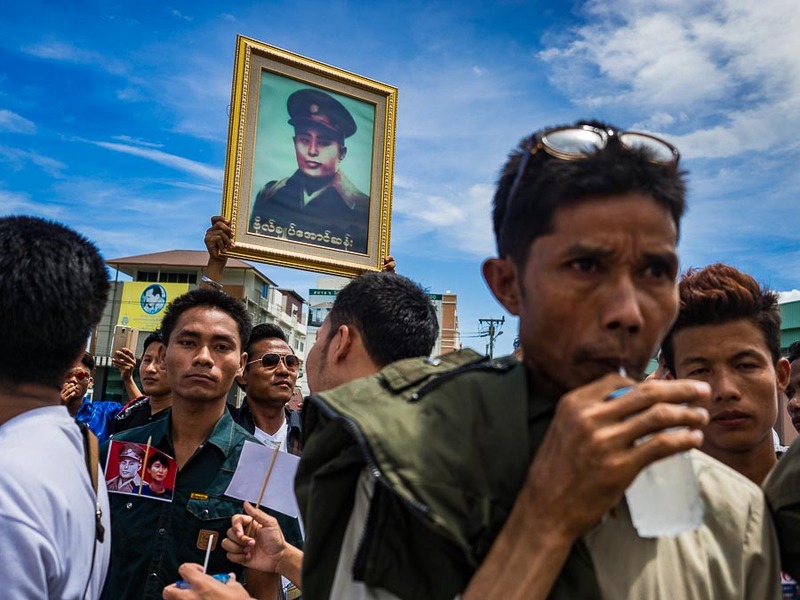 Tens of thousands of Burmese migrant workers live in Mahachai (also called Samut Sakhon) but only a few hundred people, carefully screened, were allowed into the venue where ASSK spoke. People who wanted to hear her responded by blocking the road in front of the venue. Burmese democracy icon Aung San Suu Kyi visited Thailand this week. She met with Thai government officials and visited the Burmese migrant community in Mahachai. 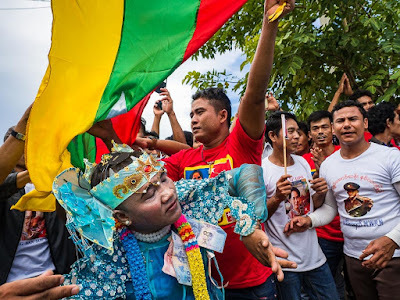 A man in traditional attire dances while other migrants wave the Burmese flag. 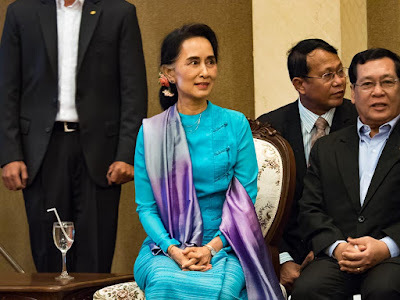 Suu Kyi is revered by most Burmese. She is the only daughter of General Aung San, the Burmese independence leader who negotiated Myanmar's independence from Britain. He was assassinated shortly before he could take office as the leader of independent Burma. The Nobel Peace Prize winning human rights advocated battled a corrupt military government that imprisoned her. 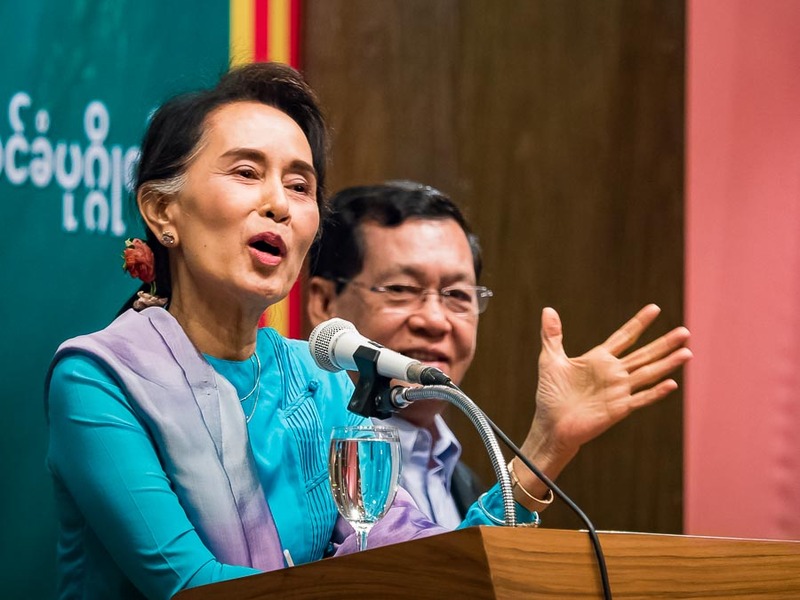 Barred from the Presidency of Myanmar by a constitutional clause specifically meant to exclude her, she led her party (the National League for Democracy) to victory in the 2015 election. After the election the NLD created a post for her (State Counsellor of Myanmar, roughly similar to Prime Minister) that ensured her primacy in Burmese politics. She's also the country's Foreign Minister. 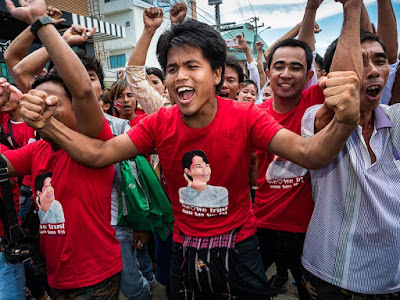 Myanmar, once the most repressive country in Southeast Asia, is now the region's most promising democracy. All because of Suu Kyi's iron will. I've been photographing the Burmese community in Mahachai since 2009. Almost every home displays a photo of Suu Kyi and a photo of her father. Burmese flags hang in the shops and homes. I was happy to be photographing in the community on the day her visit. Tens of thousands of Burmese migrants live in crowded tenements in Mahachai. Many of the migrants and other Burmese people in Thailand came down to Mahachai to see her. People wait for Aung San Suu Kyi. One man held up a photo of her father, General Aung San. Thousands of people came to see "the Lady" speak but only a few hundred carefully screened guests were allowed in to hear her. People were angry that they couldn't get in. Some blocked the roads, others talked about human rights. Others waited quietly with flowers, hoping she would stop her motorcade to talk to them. ...While some of the 250 or so invited guests, all workers in the seafood industry, wait for her to take the podium. She didn't stop though. She drove in, spoke with the invited workers for about 45 minutes and left. I was a little surprised by the brevity of the event. When she finished the media was hustled out of the room. We joined the crowd in front of the venue and waited for her to come out. By now it was absolutely pouring, the mother of all tropical rainstorms and everyone was soaked. But the rain didn't dampen spirits or break up the crowd. People waited, some chanting others calling her name, in the rain and when she came out they erupted in applause. With a wave she got into her limousine and left. The crowd trudged through the rain after she left, back to their tenements in town. 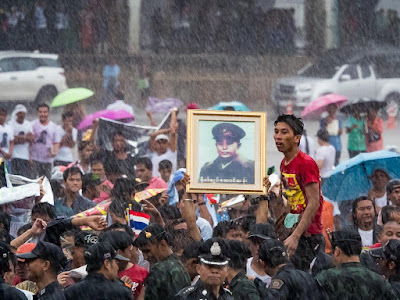 Part of the crowd waiting in the rain for Aung San Suu Kyi. I walked, with the Burmese, back to my car and rode back into Bangkok, editing in the backseat as we ploughed through heavy traffic and flooded roads. There are more photos from Suu Kyi's appearance in Mahachai in my archive or available from ZUMA Press.